If you are missing several or all your teeth, not all hope is lost to enjoy a complete smile again. 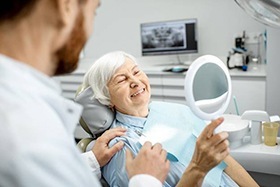 At Dental Charm, Dr. Robert Shick offers the solutions you need to rebuild your oral functions and your confidence with partials or dentures in Millburn. Although they have a bad reputation for looking and feeling fake, Dr. Shick uses the latest advancements in dentistry to carefully craft them for the utmost realism. You can smile brightly and enjoy your favorite foods again with a high-quality denture. Beautiful appearance for improved confidence. Restore your ability to eat a variety of foods. Now innovations in dentistry now provide various solutions to replace your missing teeth. After performing an initial consultation to evaluate your tooth loss and your oral health, Dr. Shick creates a customized treatment plan to restore your smile. 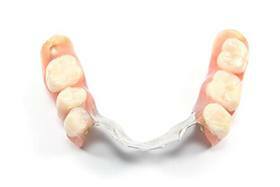 A partial denture is used for those who still have a few remaining teeth. It essentially acts as the final pieces to complete a puzzle. Prosthetic teeth are carefully crafted to match the size, shape, and color of those you have lost to ensure aesthetics and function. The prosthetic teeth are featured in a gum-colored base that has a metal framework. This allows it to clip or clasp onto your natural teeth to hold it in place. 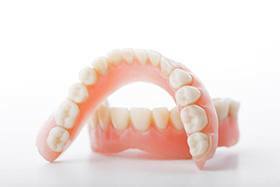 A traditional denture replaces an entire arch of missing teeth. Your dentist in Millburn, Dr. Shick takes an impression of your mouth to create an acrylic base. This holds your prosthetic teeth that are designed to look and feel natural. The denture is held to your gum tissue using suction or an adhesive. Now, you can enjoy the security of dental implants to anchor your denture to your jawbone. Implant posts are strategically inserted into your bone to support your denture. This allows you to regain as much as 70% of your biting force while also enjoying a solution that can last for a lifetime. If you are missing teeth, simple tasks like eating and speaking become more challenging. Not only does an incomplete smile impact your self-esteem but also your quality of life. If you are ready to overcome the struggles of missing teeth, dentures may be the solution for you. Dr. Shick evaluates your oral health to create a treatment plan that best meets your needs. He will help you invest in your smile with partials or dentures. 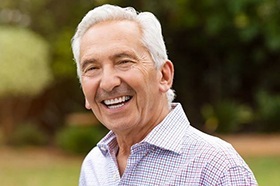 You can smile with confidence and enjoy your favorite foods again with dentures. Contact Dental Charm today to schedule your consultation to rebuild your smile.